Housing Perspectives (from the Harvard Joint Center for Housing Studies): With More than 2 Million Units at Risk, How Can the U.S. Preserve its Affordable Rental Housing Stock? With More than 2 Million Units at Risk, How Can the U.S. Preserve its Affordable Rental Housing Stock? As our most recent State of the Nation’s Housing report confirms, the renter affordability crisis shows no signs of abating, with more than one in four renters spending over 50 percent of their income on housing in 2012. With the Great Recession pushing up the number of very low-income households that qualified for rental assistance by 3.3 million between 2007 and 2011 (a 21 percent increase), the number of available subsidized rental units has not kept pace—the share of eligible households able to secure aid dropped from 27 percent to 24 percent over this period. Using the database, we determined that contracts or affordable-use restrictions for more than 2 million federally assisted rental units will expire between 2014 and 2024. This amounts to 43 percent of federally subsidized units. Rental units subsidized through two programs—the Low-Income Housing Tax Credit (LIHTC) program and HUD-funded project-based rental assistance—represent 85 percent of housing with expiring contracts or affordability restrictions (see Figure 33). Project-based rental assistance includes Project-based Section 8, as well as Project Rental Assistance Contracts (PRACs) that provide rental assistance to low-income older adults and those with disabilities. Over half (57 percent) of the units with expiring restrictions in the coming decade are subsidized through the LIHTC program, while those with project-based rental assistance account for 28 percent. Units in properties supported by HOME funding and those subsidized with USDA Section 515 Rural Rental Housing Loans represent 9 percent, while another four percent are in properties with FHA mortgage insurance, and the remaining 3 percent are subsidized through older HUD programs. Units in properties subsidized with project-based rental assistance are vulnerable to being removed from the affordable stock because these programs are subject to annual Congressional appropriations, which have continued to decline. The Senate Appropriations Committee’s recent approval of the Fiscal Year 2015 Transportation-HUD Appropriations Bill included a $200 million reduction in project-based rental assistance from the Fiscal Year 2014 enacted level. These budget cutbacks come on the heels of sequestration, which reduced the amount of available funding for project-based rental assistance contracts and forced HUD to short-fund thousands of contracts in 2013 to prevent them from expiring. Short-funding refers to the practice of partially funding renewals in the form of yearly contracts, thereby deferring ongoing costs to future fiscal year budgets in order achieve cost savings today. However, this practice creates uncertainty for owners by adding more complexity to ongoing property financing and operations. With short-funding becoming so common for the project-based assistance program, over half of the 596,000 units with contracts expiring over the next decade will come up for renewal in 2014 and 2015 alone. As federal funding becomes more uncertain and HUD struggles to fund existing project-based contracts, fewer owners who are eligible for contract renewals may decide that it is feasible to continue to rent to low-income households, increasing the likelihood that these properties may leave the affordable rental housing stock. And should budget shortfalls continue, HUD may have no choice but to allow some project-based rental assistance contracts to expire even if the owners want to remain in the program. Meanwhile, units in properties subsidized through the LIHTC program are less vulnerable to removal from the affordable stock, although they represent the lion’s share of units with affordability periods expiring over the next decade. Between 2014 and 2024, approximately 1.2 million LIHTC units will reach the end of their 15- or 30-year mandatory affordability period and are eligible to leave the program. Owners of these properties have three options: apply for another round of tax credits, maintain the property as affordable housing without new subsidies, or convert the property to market-rate housing. For the most part, according to a 2012 HUD report, LIHTC properties that reached the end of their required 15-year affordability period continue to operate as affordable housing without new subsidies. These properties remain affordable without new subsidies for several reasons: they obtain a nonprofit sponsor with a long-term commitment to continuing affordability, they have project-based subsidies such as Section 8 that the owner does not want to give up, and/or the LIHTC rents vary little from market rents. Properties at higher risk for conversion to market-rate housing tend to be owned by for-profit owners in high-cost markets. While the LIHTC program is not subject to annual appropriations, it could be endangered by comprehensive tax reform that would take a close look at these types of tax expenditures. But given the importance of the LIHTC program in both new production and preservation of affordable rental housing, it does have broad political support. 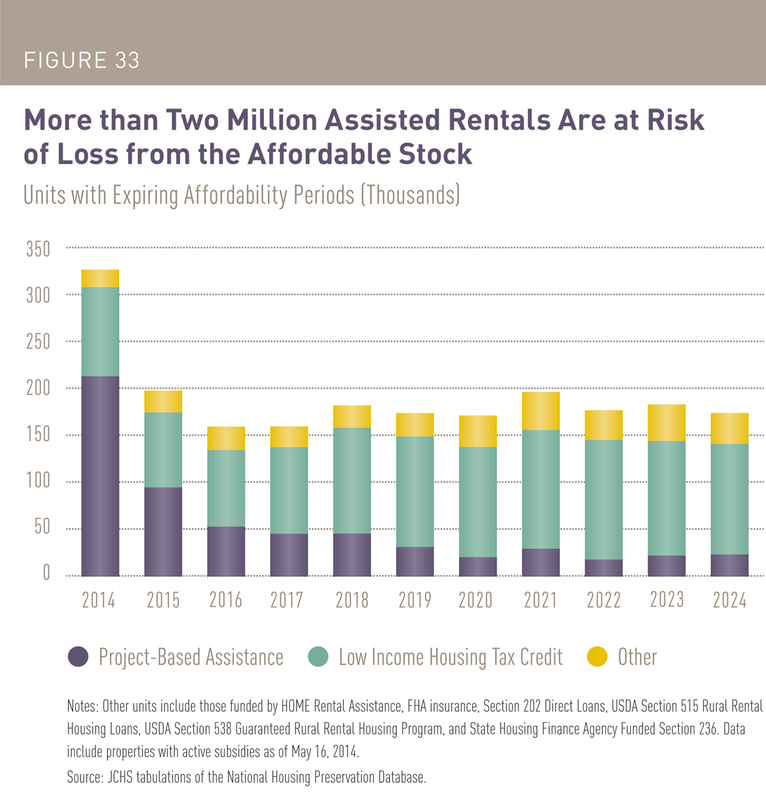 Given the gap between the demand for rental assistance and the number of assisted units available, there is a clear need for greater efforts to both preserve and expand affordable rental housing developments. Preservation initiatives such as HUD’s Rental Assistance Demonstration (RAD) help ensure that approximately 16,100 rental units in privately-owned properties subsidized through older project-based assistance programs (Rent Supplement and Rental Assistance Payment) remain affordable even after their nonrenewable contracts expire. Yet, RAD only addresses a small part of the growing need for preserving such housing. Meanwhile, promising large-scale initiatives such as the National Housing Trust Fund have stalled due to lack of funding. Signed into law in 2008 as part of the Housing and Economic Recovery Act, the fund is a permanent program not subject to annual appropriations and has the potential to preserve a substantial share of federally assisted rental housing while also adding new affordable units. The fund was also the first new production program targeted to households with extremely low incomes since the creation of the Section 8 program in 1974. Unfortunately, the program remains unfunded to this day. Initially, it was to be financed with contributions from the GSEs, but these contributions were suspended indefinitely once Fannie Mae and Freddie Mac were taken over by FHFA in 2008. Most proposals for GSE reform, including the Johnson-Crapo bill making its way through the Senate, include some provision to fund affordable housing, but it remains unclear when Congressional action will occur, and what form, if any, the final legislation will provide for affordable rental housing. The Joint Center’s research highlights the need to preserve the valuable affordable multifamily properties that already exist across the country and serve low-income families, seniors, and individuals with disabilities. Preserving an existing home is significantly less expensive than constructing new affordable housing. Preservation protects the billions of taxpayer dollars already invested in affordable rental housing. Affordable housing preservation is also fundamentally green, as it saves energy by using existing buildings and infrastructure, by protecting green spaces, and by reducing household energy use. Today, 45 state Housing Finance Agencies encourage preservation in their allocation of Low Income Housing Tax Credits. The federal government needs to complement these state resources with a strong commitment to fund affordable housing preservation. Low-income residents should have the choice to remain in decent and affordable homes and help strengthen and grow their neighborhoods into economically vibrant communities. That is the essence of housing preservation.